Cannondale has had a long history of making fantastic race bikes. From the creation of the CAAD series (Cannondale Advanced Aluminum Design) in the late 90′s, Cannondale has been a leader in aluminum race bikes. Even after the carbon fiber take-over of the market, Cannondale continues to believe that even though carbon can be built to be lighter, stiffer and in most respects, faster, the aluminum frame still has a place in the market. As every line of production, the CAAD Series has evolved over the years. 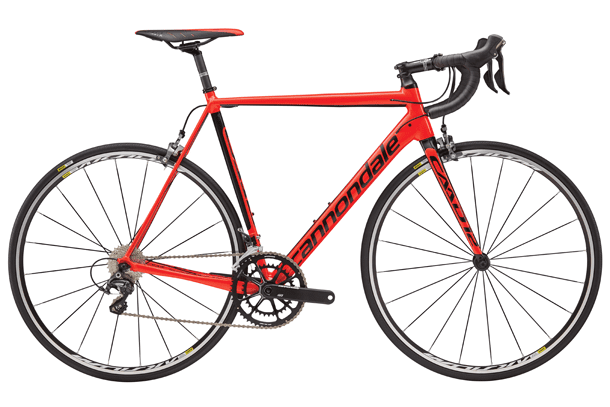 In 2015 Cannondale re-vamped the CAAD Series once again and named its new creation, the Cannondale CAAD12. The new Cannondale CAAD12 has been completely redesigned from top to bottom. The 2016 Cannondale CAAD12 uses a all new one piece BallisTec carbon fork to start the front end off that allows for 6 % better side stiffness and utilizes the Speed Save technology for a 10 % more more compliance. The frame starts out with a SmartFormed 6069 alloy frame. The seatpost is a 25.4 diameter which allows for a compliant seatpost. The new Cannondale CAAD12 uses internal cable routing which allows for a super clean look. The head tube is a tapered hourglass head tube. The bottom bracket is a BB30A which allows for a wider 73 mm asymmetric BB shell and asymmetric oversized chain stays that’s welded to a flared Delta Seat tube for an added 13 % BB stiffness to weight just in the bottom bracket and chainstays area. By having a larger larger bottom bracket shell it allows for the use of a larger diameter tire. The frame comes in at 1098 grams and is 52 grams lighter than the previous Cannondale CAAD10. I have been riding and racing the Cannondale CAAD 12 for the last 4 months. To give a comparison, before this I was on the SuperSix Evo Hi-Mod. As we all know the SuperSix Evo Hi-Mod was voted best road bike last year by many prestigious critics. When I jumped on the Cannondale CAAD12, I was blown away at how quickly it accelerated, it jumped out of every corner, and transfers every watt I put into the pedals. I’m 170 pounds and with most bikes, I can normally feel flex near the bottom bracket or rear chain stays, but not with the Cannondale CAAD12. The stiffness of the alloy frame paired with the carbon fork keeps the bike solid around the fastest corners as well as comfortable on the longest roads. I’ve been lucky enough to ride this in some of the toughest criteriums in the nation this year and it has held its own. When I line up at a race and see the peloton stacked with pricey carbon bikes of all names, shapes, and sizes I don’t feel inferior at all, if anything I feel superior to many having a trustworthy bike that has the qualities of the fastest race bike out there. While the SuperSix Evo Hi-Mod was a bit lighter and more comfortable, for the difference in price point, the Cannondale CAAD12 is an unbelievable bang for the buck. With no doubt in my mind, I would recommend the Cannondale CAAD12 to the rider and racer at both the amateur and professional level. To the college student on a budget, and the master racers who wants a spare crit bike, the Cannondale CAAD12 will be one of the best options out there for you, as it has been for me. For more information on the Cannondale CAAD12, please visit Cannondale.com.